How Low Can Abercrombie & Fitch Go? Shares of Abercrombie & Fitch (NYS: ANF) hit a 52-week low on Wednesday. Let's take a look at how it got there and whether cloudy skies are still in the forecast. The retail sector has had it rather good over the past couple of months with warmer weather getting consumers out of their houses and into the stores sooner than expected. Abercrombie & Fitch, though, hasn't been nearly as lucky. Abercrombie has struggled with multiple issues, including the rising costs of both expanding internationally and of raw materials (cotton), and stagnant growth in U.S. markets while its European stores struggle mightily. Uncertainty surrounding ongoing recessions in some European nations led Abercrombie's same-store sales to decline by 5% in its latest quarter and the company to forecast a single-digit comp decline for the remainder of the year. Despite the ever-changing spending habits of consumers, what really stings about Abercrombie's new lows is that some of its peers are doing very well. American Eagle Outfitters (NYS: AEO) has more than doubled off its lows after reporting a 38% increase in adjusted EPS and an 18% rise in sales. Similarly, Zumiez (NAS: ZUMZ) , which sells apparel to the younger, more action-oriented crowd, has benefited from a string of double-digit same-store sales increases. Even Aeropostale (NYS: ARO) , a discount retailer that has had untold troubles controlling inventory levels and minimizing discounting, has doubled off its lows. 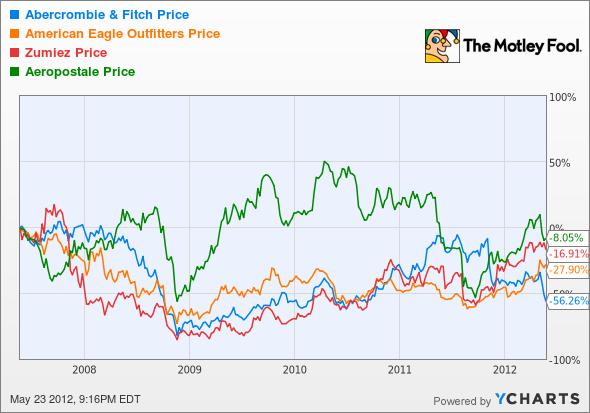 Let's see how Abercrombie & Fitch stacks up next to its peers. As you can see, the past five years have been brutally unkind to retailers -- even those like Zumiez that are currently outperforming their peers. I never thought the words would clear my mouth, but Abercrombie & Fitch is a borderline value play. I say "borderline" because the retailer's comps are heading in the wrong direction, and with 20% of its business tied to Europe, it could be in for more pain and lowered estimates in the very near future. American Eagle, as always, it seems, continues to offer a premium dividend, but even I admit its valuation is getting a little pricey considering that the retail sector will be up against more reasonable comparisons now that we're out of the warm winter months. Zumiez's success can be attributed almost entirely to its decimation of Pacific Sunwear (NAS: PSUN) , which is closing stores and cutting costs in an attempt to avoid bankruptcy and reorganize. Zumiez is the quickest growth retailer of the bunch based on same-store sales, but it's also the priciest based on forward earnings. Aeropostale appears to be another reasonably priced retailer, but its affinity for using big discounts to move product is always a sore spot for long-term investors. Inevitably, Aeropostale's products will fail to be a hit and margins will take a huge hit when that merchandise is cleared out. Now for the real question: What's next for Abercrombie & Fitch? That answer is going to depend on whether or not it can figure out how to grow its stagnant U.S. operations, and whether it can compete against lower-priced retailers like American Eagle that are offering styles similar to Abercrombie's. Unfortunately, teenage tastes are hard to predict, making Abercrombie's fortunes also difficult to predict. Our very own CAPS community gives the company a dreaded one-star rating (out of five), with 71% of members who've rated it expecting it to outperform. Although I have yet to make a CAPScall on Abercrombie & Fitch, I'd be leaning toward a short-term underperform call and a long-term outperform call. Investors need to face the facts that Abercrombie's brand name is no longer strong enough to carry its appeal among teenagers; price is also a factor. With its struggles in Europe coupled with lower-priced competition from American Eagle, Aeropostale, and others, Abercrombie is really going to need to redefine its brand image in order to get its sales moving in the correct direction again. I feel it has all of the tools to turn itself around; the question now is: Can it execute? When I see tangible results that signify it's executing again, I just may have a CAPScall of outperform waiting. Until then, I'll wait patiently on the sidelines. Abercrombie & Fitch may not be the right stock for you, but if you'd like the inside scoop on three companies that our team at Motley FoolStock Advisor feels could outperform internationally, then you're in luck! Click here and this latest special report is yours, for free! Craving more input on Abercrombie & Fitch? Start by adding it to your free and personalized watchlist. It's a free service from The Motley Fool to keep you up to date on the stocks you care about most. At the time this article was published Fool contributor Sean Williams has no material interest in any companies mentioned in this article. You can follow him on CAPS under the screen name TMFUltraLong, track every pick he makes under the screen name TrackUltraLong, and check him out on Twitter, where he goes by the handle @TMFUltraLong.The Motley Fool owns shares of Aeropostale. Try any of our Foolish newsletter services free for 30 days. We Fools don't all hold the same opinions, but we all believe that considering a diverse range of insights makes us better investors. The Motley Fool has a disclosure policy.